There is something to be said about the romantic feel of a beach wedding. The sand, the candles, and the tropical flare can certainly add a romantic, but personal touch to your wedding. If you are hosting a beach theme wedding, the decorations can make or break your idea. No matter the location of your wedding, beach or not, the decorations need to follow suit. Though in most weddings the flowers are the star of the show, in a beach themed wedding here in Gilbert, Arizona they should actually be used as an accent. After all, the beach is not teeming with flowers. The flowers you do use will be determined by the route you are taking with your theme. Tropical themes should use bright tropical flowers such as orchids, bird of paradise, or plumerias. A more traditional beach wedding needs to use neutral colored flowers that are classified as "romantic blooms", such as roses, calla lilies, hydrangea,or peonies. Pair your flowers in arrangements with sand, sea shells or netting, and try to use flowers sparingly. Your table decorations are the focal point of the reception. Your guests spend a large amount of their time at their table, so you need the decorations to follow your theme. Beach themed wedding table decorations need to also follow the direction of your theme - tropical or traditional. Tropical themed weddings should use bright colored tablecloths accompanied by a neutral table runner. For example, bright green table cloths can be paired with ivory runners. Traditional beach themes should stick to neutral or pastel colored table linens, such as a baby blue tablecloth paired with an ivory runner. Centerpieces can be as simple as a platter full of sea shells, or more elaborate, such as hurricane vases filled with sand, sea shells and candles. Use place card holders that resemble sea shells or tropical fish. Tie off napkins with sea shell napkin rings or sailor's rope to finish off the setting. The wedding cake is always an important item in any wedding. You want your cake to follow your overall theme by using decorations that are similar to those on the tables. For example, a tropical beach theme can use a bright green fondant cake decorated with tropical flowers that cascade down the side. 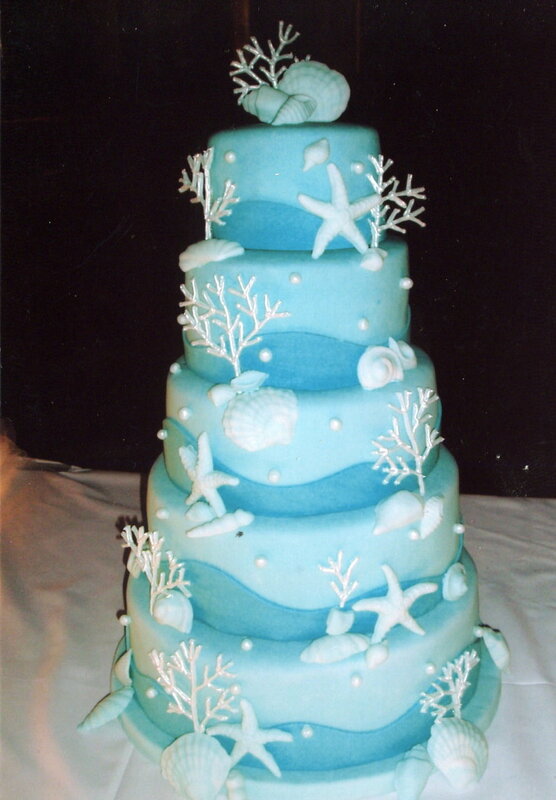 A more traditional wedding can use an ivory cake with gumpaste seashells placed on each tier. 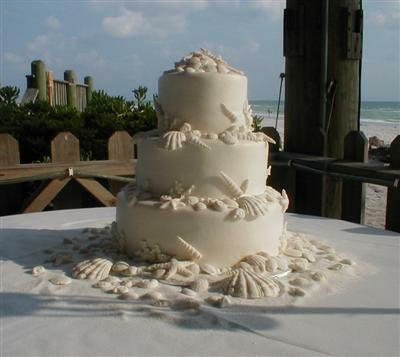 Surround the cake with faux sand made of brown sugar, seashells, and candles to give it a more romantic look. You can even write your names in a heart in the sand, just as if you were at the beach! Give your guests a first glance into the wedding theme by decorating the ceremony with beach theme wedding decorations as well. For a tropical wedding, keep the ceremony bright. For example, dress the pews with tulle, tropical flowers, and fisherman's net. Use garlands of tropical flowers and organza to drape over archways as a finishing touch. For a ceremony at dusk, use tulle laced with sea shells to swag on the back of pews, and add hurricane lamps with sea shell candles at the end of each pew to create a more romantic feel to the entire event. Don't forget, Val Vista Lakes is the only wedding venue in Arizona, that I know of, that offers beachfront property for your beach themed wedding!